Fr. Patrick Cardine joins us to talk about the beautiful new CD produced by his parish choir. St. Patrick Antiochian Orthodox Church is a parish in the Western Rite tradition and the recording is available as a CD or as downloads. Go the the parish website to learn more. An interview with Dr. Richard Toensing, composer of a new CD from Cappella Romana which includes 12 NEW Orthodox Christmas carols! 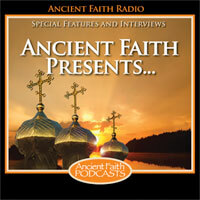 Georgia Mamalakis joins us to talk about a group of women joined together over many miles to pray the Psalms during the Nativity Fast but also during Great Lent.